Smartphones may be commonplace in the West but countries like Japan have yet to make the move to the PDA-like handsets en masse. 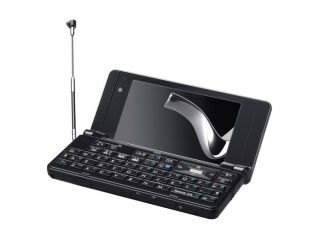 Instead, companies such as Softbank Mobile bridge the gap with hybrid phones like the new 922SH. The Sharp-made handset has just gone on sale in Japan using a common-or-garden phone operating system instead of Windows Mobile, or something offering functions more akin to those found on a PC. It manages to stand out from the pack by opening sideways instead of lengthways, and looks rather like a tiny laptop with a full Qwerty keyboard. Under the hood, there's support for W-CDMA (Wideband Code Division Multiple Access) and tri-band GSM (Global System for Mobile communications), as well as a two-megapixel camera (and a 0.1-megapixel sensor on the screen side for videocalls), Bluetooth, a microSD card slot, 1-seg digital TV and GPS. At 132g and with a 3.5-inch screen, the 922SH offers a decent weight/screen-size combination, plus Softbank has kitted it out with an RSS reader and a full website browser. With those kind of specs, it's clear Softbank is aiming at the massed ranks of Japan's bloggers – folk keen to post to websites but not necessarily bothered about ever doing so from a computer. Considering that there are more blogs are in Japanese than in any other language, an incredible 37 per cent at the minute, the prospects look good for the 922SH. Moreover, that GSM chip means there's a slim chance of getting hold of one of these for a spot of unlocking action.